The most advanced Clinical Data Management Software (CDMS), Electronic Data Capture (EDC) & Clinical Trial Management Software, all-in-one! 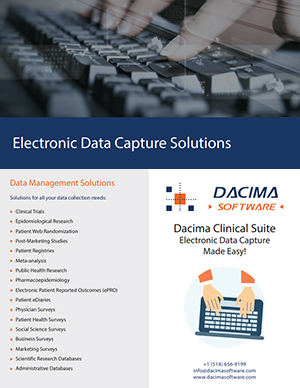 DACIMA CLINICAL is an advanced electronic data capture (EDC) and clinical data management system (CDMS) for capturing, managing and reporting clinical research data optimizing data collection by efficiently streamlining clinical data collection process. The software has been designed to meet the needs of CROs and pharmaceutical companies, government agencies as well as research institutions and academic researchers. 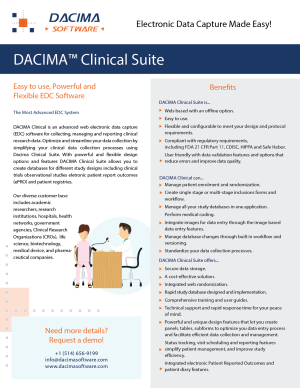 DACIMA CLINICAL offers unprecedented flexible allowing you to design databases for any of your organization’s clinical data collection needs, as well as the unique features required clinical trials, all from one platform. Whether you are conducting a clinical trial, an observation study, a patient registry or need to design an administrative clinical database, DACIMA CLINICAL does it all! No need to purchase and maintain different software packages for different study designs. Built on a highly scalable architecture and compliant with good clinical practices and FDA 21 CRF Part 11 requirements, DACIMA CLINICAL is cost-effective, whether managing a single clinical trial or study or a large multi-center international study. There is no need to compromise depth of functionality for ease of use and efficiency. DACIMA CLINICAL is the most advanced electronic data capture and clinical data management system. With user-configurable parameters, sophisticated eCRF design options, simple and complex edit checking, conditional logic for incorporating simple or complex skip patterns (enable/disable, visible/hidden and colour dependencies), dynamic form activation, data importation for external sources, and other advanced options. User-friendly design, easy to use Graphical User Interface (GUI) that allows you to setup forms, manage access rights and enter the data. Powerful and flexible software with broad control of database design and implementation. Rapid project development and deployment. Manage all your projects/studies from one application. Track changes to data and history. Compliant with FDA 21 CFR Part 11 and GCP. 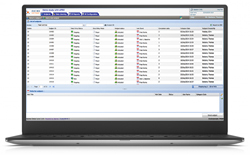 DACIMA Clinical Suite is an innovative EDC technology that allows users to setup and configure databases through an easy to use web-based graphical user interface without programming and database design expertise. Dacima takes the programming out of database development! Through easy to use modules you can create study databases, administer access and collect and the data collection process. Manager (Administrator) Module: allows the administrator to create users and assign user permissions through a role based user management. Designer Module: allows you to design and configure the study and related data entry forms through an easy-to-use web interface. Flexible and powerful design options and features let you tailor the interface to you needs and customize elegant and efficient data entry forms all without any computer programming. Data Entry Module: allows end users to access the subject status tracking, data entry forms, reporting features, medical coding and data extraction features. The intuitive and user-friendly interface makes study management and data entry easy. 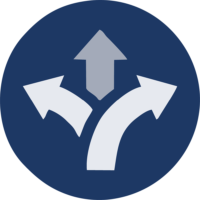 ODM-XML* is a vendor-neutral, platform-independent format for exchanging and archiving clinical study data. ODM-XML includes all information (clinical data, along with its associated metadata, administrative data, reference data, and audit information) necessary to share among different software systems during study setup, operation, analysis, submission and for long-term retention as part of an archive to facilitate the regulatory-compliant acquisition, archive and exchange of metadata and data. 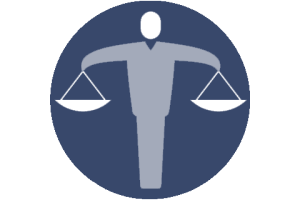 ODM has become the language of choice for representing case report form content. Powerful web database development and management software allows you to develop databases without the need for computer programming expertise. Flexible, commercial technology. By activating or deactivating features the software can be easily tailored for different research study designs, such Randomized Clinical Trials, observational epidemiological studies, patient registries, patient interviews or administrative databases. Access to databases through any web browser independent of the operating system. State-of-the-art robust technology infrastructure based on Microsoft .Net, html and Java; easily customizable. Advanced scalable web-based architecture. Ideal for small single center or large multi-centered research studies (e.g., for multi-center clinical trials or cohort studies). Offline options allows you generate an client application from the web database which can be installed on PCs for offline data entry making it ideal for data collection in regions with poor and unreliable internet connectivity. Easy form design with from library for easy re-use of forms across different studies or projects. Multi-lingual software, supporting English, French, Spanish and Chinese, with ability to easily incorporate other languages. Compliance with U.S. Food and Drug Administration (FDA) 21 CFR Part 11. Can be used for medical research data collection such as for randomized clinical trials, and is compliant with Good Clinical Practices (GCP) and regulatory requirements (FDA and ICH). Data clarification (query) management and reporting features for enhanced data quality and resolution of data queries. Electronic signature and monitoring features. Complete audit trail insures that changes to data are tracked. Meta-data dictionary: Automatically generated data dictionary report contains descriptions of all the data entry fields (variables) in a study. Accesses to the individual user-created databases are password protected. Built in standard reports for clinical research. Data validation and quality control features for validation checks, skip patterns, formula within form or across different forms. Dynamic logic and validation controls executed in real time. Dynamic logic for form activation/deactivation allows you to activate or deactivate forms based on the data values entered. Data export and import features. Built in standard reports and query builder allowing for extraction of specific data and creation of data output for custom reports without the need for programming. SAS code generator automatically writes SAS import code, Proc format, label code. Web randomization module allows you to configure patient randomization. Multi-step inclusion options allowing you to screen/include subjects and complete the inclusion or randomize at a later time point. Ability to embed subforms within main forms creating more fluid and user friendly data entry forms, simplifying the data entry process, and increasing data entry efficiency. Ability to create tabular display of data entry items and to split your form into sections using the panels feature. The advanced design feature allows you to create forms that closely resemble your paper questionnaires or Case Report Forms. Image based data entry allows for zones or regions on images to be specified as data entry fields. Workflow and versioning allows for easy modification of the projects even when the project is in production mode (collecting real data). The Visit Scheduler automatically schedules subject/patient visits, creates reminders and “to-do” lists to help manage the data collection, patient visits and the interviewing process, thus enhancing the project management and efficiently.